A very cold night with rain pouring down, I made my way to my pre match pub (The Old Farmhouse) met up with my usual group of friends, Ms S amused us by saying that Jose wouldn't be playing as it was his wife's birthday, adding that she wouldn't be impressed if I bogged off to play football on the night of her birthday! Arrived at the ground cold and soaking wet immediately bought a hot chocolate (which was dreadful) in some attempt to get warmer, made my way to my usual seat in Itchen North, my first thoughts were that the pitch looked very poor compared to normal, the Watford fans to my right were in fine voice although lacking any original Songs. The tactics Koeman had chosen soon became apparent, Saints were playing a back 3 of van Dijk, Fonte and Bertrand with Cédric and Targett pushing on very wide, with Forster back in goal, the defence seemed far more confident, the midfield trio of Romeu Clasie and Davis pressing on everything, Long was up top and Mané had a fairly free role. Watford tried to play a short passing game which proved very ineffective in the wet conditions, especially with Romeu, Classe and Davis closing them down quickly, time and time again they lost possession. Mane in a very free role was tearing them to pieces, Watford couldn't cope and Saints seemed to have space everywhere. On 16 minutes Saints went into the lead, Targett looking superb as a wing back, put in a great telling cross, which Long put away with a fine header. Shortly after the goal Gomes made several great saves from both Mané & Long. Cédric was booked for what seemed like an innocent clash with a Watford defender, the defender staying down for what seemed like ages, but to the annoyance of the Saints crowd got up and seemed fine. Just before half time Mané seized on a misplaced Watford pass, got himself one on one with Gomes, did everything right but put his shot wide of the goal. The halftime conversation was about how Saints should be winning comfortably but were worryingly only 1-0 up. Second half started and we soon realised there was no need to be worried, Saints went straight back into control. 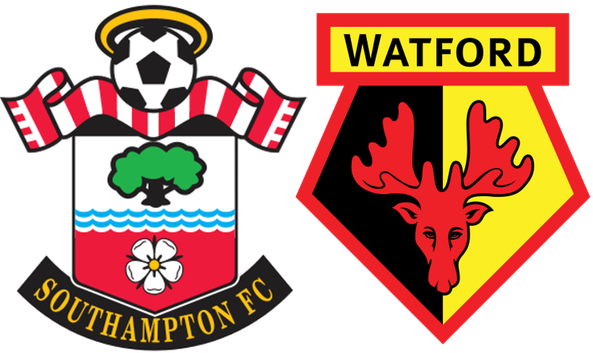 Watford were unable to cope with Saints formation, particularly with the pressing of Saints midfield trio and the constant running of Mane. Gomes was having the game of his life, saving everything that Saints threw at him. After 65 mins Davis did find the net, only for it to be ruled (rather harshly from where I sit) offside. On 70 minutes Tadić came on for Mané, who had played well, but missed numerous chances. In another game he could easily have scored 4 goals with the chances he had. Within minutes of coming on Tadić made it 2-0. After receiving a through ball he held off a couple of challenges, before slipping it low past Gomes. No more than Saints deserved. Saints had several further chances but Gomes held firm. For the last 10 minutes Saints bought on Pellè and Yoshida for Cédric and Davis. On 85 minutes Watford had their first shot on target, but Forster saved comfortably, although Saints continued to dominate, the final Score stayed at Saints 2 - Watford 0. A great team performance, difficult to say who was Saints Man of the match, they all were superb. Watford didn't have an answer to Saints performance and looked very poor, fair play to the Watford fans who kept their vocal support going to the end.